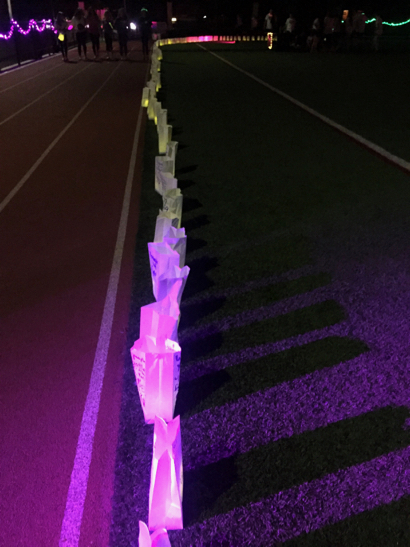 Over 300 students raised $65,000 for the American Cancer Society as part of the 3rd Annual “Menlo Park Relay for Life – Hillview Edition” on Friday night, May 19. All funds raised go to the American Cancer Society to support research to find a cure for cancer and provide services — everything from wigs to wheelchairs — for people battling cancer. More than 40 teams of students have worked over the last few months raising money through bake sales, walking door-to-door in their neighborhoods, contacting family near and far, reaching into their own piggy banks, and more. At the event, the Hillview track was magically transformed (by volunteer elves!) into a peaceful purple and green neon haven and as kids began their journey and the sky turned dark, the lights continued to fluctuate as the participants wore team color-coded neon necklaces, headbands and bracelets. Black lights lit up tables and caught festive clothing as kids, parents and teachers walked or ran around the track all evening — way past most bedtimes! 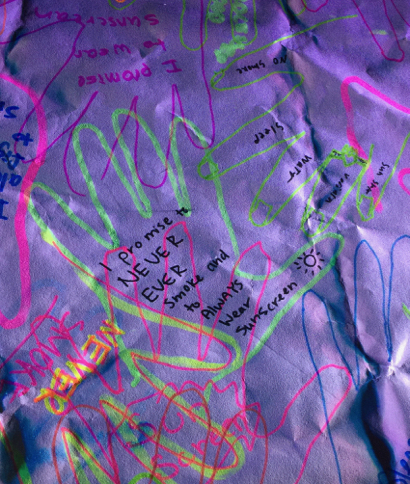 By the end of the night, the track was outlined with luminaries that participants made complete with personal messages highlighted on each bag. Most of the kids collected a bead with each lap they took and looped it onto a piece of yarn and they had fun comparing their distances with one another. The student who walked the farthest did 50 +/- laps! You can click here if you would like to make a donation to add to Hillview’s funds raised for the American Cancer Society. Although the event was focused on Hillview students and was not open to the general public, one team of students from Menlo Atherton High School’s Leo Club, a charter of the Lion’s Club, came early to help set up and participated in the event. One of the Leo club’s founders, Elise Kratzer, was an active member of the Hillview Service Team and has continued to support the Hillview Relay for Life as she has continued on to high school. A few days after Hillview’s Relay for Life event, one of Hillview’s former staff members, Ernie Imura, passed away from pancreatic cancer. Ernie, affectionately known as “Mr. I”, was a beloved physical education teacher who worked at Hillview between the years of 1987 and 2012. Aside from a short hiatus, Ernie spent 20 years working at Hillview. Staff members had raised money and walked the Relay for Life event in Ernie’s honor. Relay for Life started in 1985 with one person, Dr. Gordon “Gordy” Klatt, in Tacoma, Washington, and now takes place in 27 countries. The Hillview Middle School event is consider a pre-relay as a lead up to the 22 hour Menlo Park Relay for Life from Saturday morning, August 12 at 11am through Sunday morning, August 13 at 9am at Burgess Park. I am a friend of Ernie Imura and I would love to connect with others that knew him. I am also interested in attending this event next year and participating in his honor.